Fetal Non-Stress Test (NST) is for women who have a high risk of life during parturition. A pregnancy non-stress test monitors this ability to deliver naturally. It is a non-invasive test. Pregnancy at every stage has a risk of getting terminated. During early pregnancy, there is a lot of physical stress. But as pregnancy progresses, a lot of physical stress due to the weight of baby and pregnancy water builds up. It is important to monitor whether you are capable of delivering a baby naturally. If pregnancy has complications, then doctors can advise a C section or cesarean surgery. What is a Fetal Non-Stress Test (NST)? When do you take pregnancy non-stress test? Why is a pregnancy stress test is required? How is pregnancy non-stress test (NST) done? How long does the non-stress pregnancy take? Are there any risks associated with NST? How the non-stress test during pregnancy works? A Fetal Non-Stress Test during pregnancy is a method for checking whether the baby is healthy and is growing well. Pregnancy non-stress test measures the heart rate of fetus and response to movement. It also determines whether the baby has enough oxygen reaching to her. A Fetal non-stress test during pregnancy is done after 28 weeks of pregnancy pass. The non-stress pregnancy test is a third-trimester non-invasive pregnancy test. If the mother has gestational diabetes, then there can be a lot of complications during labor. The non-stress pregnancy test ensures that the baby is healthy and will bear the high level of strain during delivery. Preeclampsia is the condition when the pregnant woman has very high blood pressure. It is also termed as toxemia. There is swelling in limbs and urine has protein. It can lead to life-threatening bleeding during parturition. Parturition is the act of delivering a child. A pregnant woman having Preeclampsia needs to undergo pregnancy non-stress test. If the fetus is smaller than the gestational age, then the pregnant woman has to undergo non-stress test during pregnancy. It shows that the baby is not growing well and is not strong enough to take the challenging delivery struggle. Amniocentesis is the test for determining the gender of the baby. It is an invasive pregnancy gender test. Before taking Amniocentesis, it is essential to take a non-stress pregnancy test. amniocentesis is for checking lung function of the baby. Any invasive pregnancy test can cause infections and other diseases. Thus it is crucial to take the non-stress pregnancy test to monitor baby’s heart rate. If your baby stays in your womb for long even after the expected date, then you need to take the non-stress pregnancy test. It is because there are dangerous complications associated with late delivery. If your baby is still inside the womb two weeks past delivery date then a non-stress test during pregnancy is a must. If your baby doesn’t move much, then your doctor will suggest a non-stress pregnancy test. It is because it indicates that there are issues with your pregnancy. Doppler heartbeat twin pregnancy test detects whether you’ve twins. Pregnancy non-stress test tests whether the twins are healthy. Rh factor is a marker present on cells that determines your blood group. If a pregnant woman is Rh positive, she will form antibodies against Rh-negative blood. Rarely your fetus may have Rh-negative blood group. It can cause a condition called Erythrocytosis Blastosis. In this baby’s cells burst because the mother produces antibodies against them. There are immunosuppressive drugs that can prevent this health condition. Non-stress test pregnancy will help check whether the baby is withstanding the treatment or not. If you don’t have enough volume of Amniotic fluid, then you need to take the non-stress pregnancy test. Pregnancy stress tests are for babies that have high quantities of Amniotic fluids. The fluids create a pressure equally distributed in all directions. Women have to take many prenatal tests like chorionic villus sampling, biophysical profile and glucose tolerance test. If any of the tests have abnormal results, then a non-stress pregnancy test is advisable. Any complications that can affect your baby’s health are reasons for taking a non-stress test during pregnancy. There are chances that the umbilical cord may intertwine and suffocate your baby. The non-stress test pregnancy will predict a less active baby and thus any such issues. A low lying placenta can be problematic during delivery. Non-stress test during pregnancy will determine the severity of the situation. Chromosome defects can cause congenital disabilities in the baby. Any such birth defects in baby require a non-stress test pregnancy. In case you lost your previous baby during the second trimester due to inexplicable reasons then NST will help prevent such incident. The cephalic version is the procedure for a breech baby. Pregnancy non-stress test is also performed with this procedure. The non-stress pregnancy test is not your choice. Only experts can perform a pregnancy non-stress test. It is a third-trimester pregnancy test. You can expect your doctor to recommend you to take the non-stress test during pregnancy by the 28th week. A pregnancy stress test will determine any problems with the baby such as low activity. A baby’s heartbeat is around 160 beats per minute. Non-stress test Pregnancy detects your contractions during baby’s movements. This test determines how well your baby responds to external stimuli. The Fetal Non-Stress Test is non-invasive. A buzzer placed on your baby bump awakes the baby. Then using a doppler the heartbeat of the fetus is monitored. What happens during non-stress pregnancy test? Non-stress test in pregnancy involves tieing two belts around your baby bump. You’ll have to eat something and take a glass of fizzy energy drink. It will provide enough energy for your baby to move. You’ll have to use the bathroom so that your bladder is empty and also because you’ll not be allowed to move for the next 40 – 60 minutes. Next, you’ll lie down on your left side to avoid hampering blood flow. Your doctor will tie two belts around your baby bump. One will monitor the heartbeat of the fetus, and other will record your uterine contractions. You’ll be doing a job too. You will hold a buzzer kind of device that you have to press every time you feel your baby moves. Whenever you press the buzzer, it will register the heartbeat of the baby at that time. Another stretchable belt will record your uterine contraction intensity. It will determine how your labor will induce. Labor induces due to baby’s movements. When the baby starts moving too rapidly, it sends a signal to the brain to induce labor. The ratio of contractions to baby’s movements will help the doctor decide whether natural delivery is ideal for you. The non-stress test during pregnancy takes about 20-40 minutes. The pregnancy non-stress test is non-invasive and has no risks and side effects. 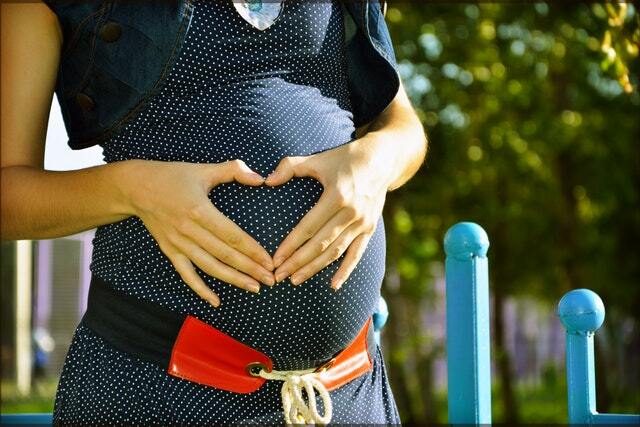 Non-stress test during pregnancy works on the principle that enough oxygen is essential for a normal fetal heartbeat. If the oxygen supply to the baby is adequate, then her response will be reactive to the external movement. Non-stress test Pregnancy checks the fetal heartbeat and oxygen availability. Pregnancy non-stress test is only done after 28 weeks of gestation. Before 28 weeks the baby is not capable of responding to external stimulus. Non-stress test during pregnancy results is namely reactive and non-reactive. Reactive NST pregnancy result: The reactive result means that your baby is moving actively. He or she is responsive to any stimuli given. It shows that your baby heartbeats at the right pace. The oxygen supply to your baby is ample. Non-reactive NST pregnancy result: A non-reactive result of pregnancy stress test is negative. It shows that your baby isn’t moving enough within the 40 minutes span. A non-reactive result does not mean that your baby is at risk of any disease. It could be that he is still asleep. You could be taking specific prescriptions that reduce the activity of baby. Poor oxygenation is the primary reason for the nonreactive non-stress test. If you get a non-reactive result of the non-stress test during pregnancy, then your doctor might recommend a pregnancy stress test. Other prenatal tests like biophysical profile may be considered. Cost of a non-stress test during pregnancy is around 185$ to 286$ depending on the hospital. You don’t need to bother yourself about when to take a pregnancy stress test. However, if you sense that your baby moves very less, then talk to your doctor about it. Next articleWhy Am I Not Getting Pregnant?